As the parents of boys in kindergarten and 2nd grade, it seems like we are hitting the sweet spot for reading. They have reached the point where they can enjoy books on their own or read aloud with the grown-ups. Over the past few months, we’ve amassed a few favorite books for k-2nd grade so I thought I would share them in the first of several holiday gift guides I’m planning for this year. If you are a family of book-lovers, you know this list just scratches the surface of goodness out there. There is something truly wonderful about turning the pages of a new book and I hope my boys enjoy this hobby for years to come. Many more could be included, but these are the books for k-2nd grade my boys come back to again and again. Some of these are books I received to review over the years, some were purchased and some are from the library. This post contains affiliate links, which means I make a few cents if you order using my link. Thanks for reading! Branches books from Scholastic are fantastic chapter books for emerging readers. If your child is comfortable reading picture books, but overwhelmed by all the text of a chapter book, these series are grea t! Like the name suggests, they act as a branch between the two styles. Dragon Masters, and The Notebook of DOOM are two of Oscar’s favorite series in this style, but there are many more. If your little one is up to the challenge, I recently bought The One and Only Ivan because Oscar’s teacher used it as a read-aloud in class and he loved it. He wants to read it again now that we have it but I get it first! As cat lovers, we also enjoy Papillon, the Very Fluffy Kitty. I happen to think the illustrations are adorable and it’s a nice little read aloud for kindergarteners. Verdi is an older book my son brought home from the school library. It has incredible artwork (yes, snakes!) but what I loved most was the story about how things aren’t always what they seem. This book takes a look at what it’s like to grow up and how our perspective changes as we grow older and can bring a greater understanding of those around us. 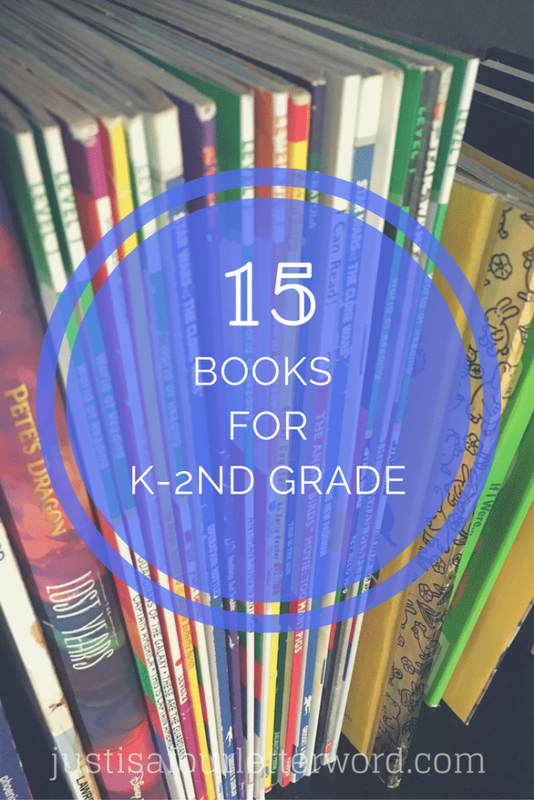 While I think any of the books in this post would be great for most early elementary aged kids, the below options have an especially great appeal to a broad age-range due to the great pictures and fun reading. Both my boys get a lot out of these books so if you’re sticking to a budget and want something that pleases everyone, this section is a great place to start. Who doesn’t love crazy facts? National Geographic Kids is back at it with Weird but true! 8 with 300 more insane facts. Oscar has read through the entire book twice. He can’t get enough, which means I should probably go ahead and add volumes 1-7 to our shelves at some point! Calvin likes flipping through the pages to enjoy the photos and bright colors, but I have a feeling his interest will only grow as his reading skills improve. Earlier this year, LEGO came out with a series of nonfiction books and both kids love them. Since Calvin is only beginning to read, he looks through the photos and images of LEGO minifigures and we talk about the themes of the book, whether it’s Deep Dive with Sharks, Planets, Dino Safari, or Knights and Castles. If you ask Oscar, he’ll tell you his favorites are Dino Safari and Knights and Castles, both of which he has read from cover to cover several times. It’s no secret that we are a house full of Star Wars fans. And as children of the 70s and 80s, Jerry and I flipped when we saw this Star Wars Little Golden Books boxed set. The set comes with one book for each of the first six movies but you can purchase Star Wars: The Force Awakens book separately. Finally, this has been the year of Harry Potter in our house. Jerry has been reading them aloud to Oscar all year and while Calvin isn’t quite ready for much of the story, he definitely has an understanding of the characters and basic plot lines. I really want to add the gorgeous Harry Potter illustrated books to our library for a few reasons. First, they are just incredible to look at. They are hardcover books full of beautiful drawings that really enhance the story. Secondly, they are unabridged so there is no trade-off when buying this version. And finally, these books are being released once a year like the original series. Only the first two books, Harry Potter and the Sorcerer’s Stone and Harry Potter and the Chamber of Secrets, are currently available and since my kiddos missed the first go around, I like the idea of having a new book to look forward to each year as they grow up. Did you read The House with a Clock in its Walls growing up? We have thoughts on that movie too. There are so many more I could share, but hopefully this list will give you some great ideas! I’d love to know which books are being read and re-read in your home. Please share them in the comments! Like it? Share it or save for later! Can education prepare you for a freelancing career? Imaginext DC Super Friends Super Hero Flight City – Kindergartner Approved!